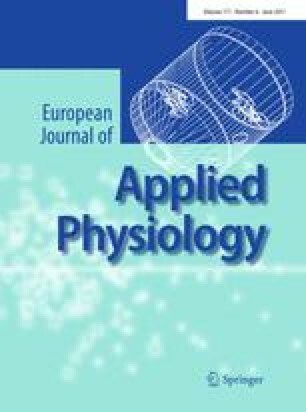 The purpose of this study was to analyze the cardiorespiratory, neuromuscular and kinematic responses obtained during the stationary running in aquatic and dry land environments. Twelve women took part in the experimental protocol. Stationary running was performed for 4 min at three submaximal cadences and for 15 s at maximal velocity, with the collection of kinematic (peak hip angular velocity (AV)), cardiorespiratory (oxygen uptake (VO2)) and neuromuscular variables (electromyographic (EMG) signal from the rectus femoris (RF), vastus lateralis (VL), semitendinosus (ST) and short head of the biceps femoris (BF) muscles) in land-based and water-based test protocols. Factorial ANOVA was used, with an alpha level of 0.05. AV was significantly higher when the exercise was performed on land, and became significantly higher as the execution cadence increased. Similarly, VO2 was significantly higher in the land-based exercise and rose as cadence increased. With the increase in the submaximal execution cadences, there was no corresponding increase in the EMG signal from the VL, BF, RF and ST muscles in either environment, though such a significantly increase was seen between the submaximal cadences and the maximal velocity. Dry land presented significantly greater EMG signal responses for all muscles at the submaximal cadences, except for the ST muscle. However, at the maximal velocity, all the analyzed muscle groups showed similar responses in both environments. In summary, for both environments, cardiorespiratory responses can be maximized by increasing the submaximal cadences, while neuromuscular responses are only optimized by using maximal velocity. This study was supported by CAPES and CNPq. The authors wish to thank MIOTEC and INBRAMED companies for their invaluable contribution to this study.